The harmonious mishmash of yellow and grey is cordially great for a wedding. 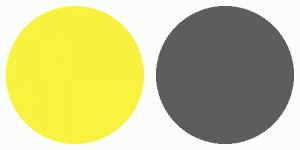 Yellow is bold and when partnered with grey, it can create a bright and delicate atmosphere of love. In this wedding, the bride is a graphic designer. She made her own invitations. She also handmade the napkins, by which the guests found their tables (there was a swatch board and each table had a different gray or yellow pattern). The school bus transported the bridal party from the ceremony to the reception. Tell us what you think of this color palette int he comments below!